Modernize your iPhone 4 | Shelby White - The blog of artist, visual designer and entrepreneur Shelby White. 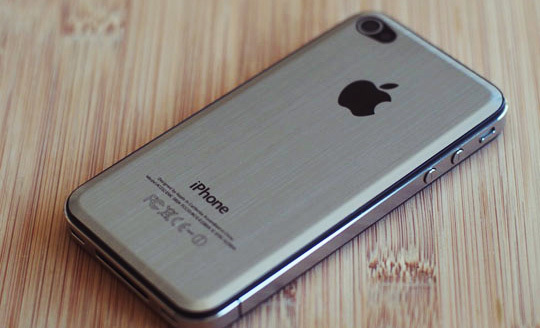 Air-brushed aluminum look? Don’t mind if I do! I’ve yet to damage any part of my iPhone 4 (knock on wood), but this cover makes it feel so modern that I had to buy it. For just $12, it makes the phone look sexier than ever. The cover is beveled and and super easy to install. All you have to do is unscrew the two base screws from the bottom of the phone. Of course, this probably voids your warranty. If you don’t care for the visual beauty of the iPhone, then perhaps you might try one of these instead. oooh, I like this a lot! Maybe a millimeter I’d say. Not enough to ever worry about. Can’t find the one that still has the apple logo on the link, can you give a more precise link? Thanks a bunch! Can’t wait to get my Verizon one on the 3rd at 3 AM! Pretty sure they had to take the logo off because of legal reasons. Was a good move anyhow considering it rubbed off within the first week I had it. Looks better anyways. Does anyone know where I can find this for the Verizon iPhone 4? sus datos de contacto , aunque?